Entrepreneurship and productivity. Momentum and movement. Cultural and personal resilience. Creativity and musical innovation. A city of vibrant painted buildings and abundant jungle. This is the new Medellín. Perhaps not the Medellin you might know it to be, but it certainly is the city of eternal spring for our Unsettled experience in 2019. Medellin is going through a pivotal moment, and we want to be part of it. For many years, Medellin (and Colombia, in general) has been known for many things. Its violent past. Some epic tales. Plenty of delicious food. A political unrest. And a certain Netflix show (yes, that one). But we’re here to tell you that Colombia has a new story, and in fact, an uplifting story about regeneration, innovation, and youth. Today, Medellin boasts an emerging tech culture and dedicates all creative and social resources towards innovative development projects. You’ll be amazed at how well the city has transformed itself into a haven for social urbanists, coffee snobs, entrepreneurs, and trendsetting creatives. In more than one way, we've found Colombia to be one of the most accessible of our locations around the world. First, we find that it's easy to connect with and bridge cultural and language barriers with Colombians. In a social group, they're friendly to foreigners in a matter-of-fact kind of way. At home, they're welcoming and inviting. Unsettled participants often get invited into someone's house and are treated like an extended family, whether it's in some of the poorest, urban neighborhoods, in a community center, or after a fun night out. In business, they're eager to please with a strong customer-service game. This might not sound like much, but it's important when you're only staying somewhere for one month. So what can you expect on an Unsettled Medellín retreat? On a typical month-long Unsettled experience, participants have retreated to a green oasis in the middle of the city to enjoy a cup of coffee. The soccer fans have immersed in the local ‘fútbol mania’ by watching local city teams clash on the field. Meanwhile, the adrenaline seekers have experienced Medellin’s amazing contrast of rural and urban views all at once, whether hiking the edges of the Valle de Aburrá or paragliding over the nearby mountains and valleys. A city of nearly four million people, Medellín has reinvented itself to be an important creative hubspot for digital nomads and remote workers alike. The people from Medellín, affectionately known as “paisas,” are some of the most entrepreneurially minded people we’ve met. "Colombia is Passion” has become a hallmark of the Colombian people, and whether you’re working from the modern streets of Medellín or you go horseback riding with us in the countryside, this passion is sure to wear off on you. 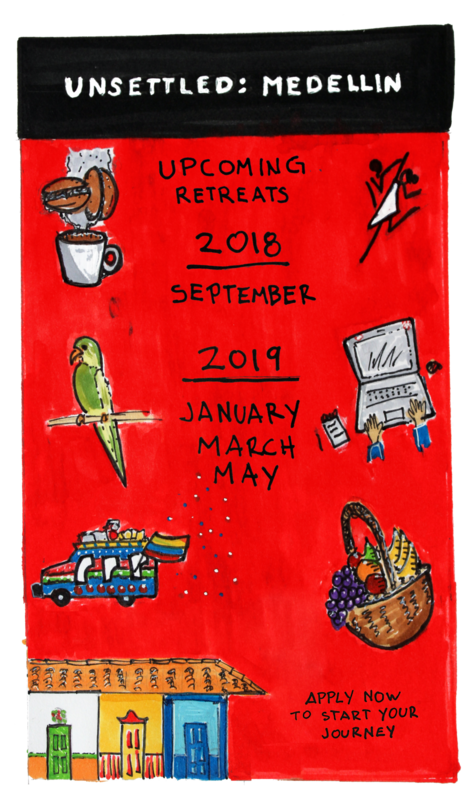 Either way, we’ll be waiting for you in the vibrant and cultural oasis of Medellin 2019, as we’re going back to host month-long retreats in Colombia in January, March and May 2019. Want to hear from someone who’s done Unsettled Medellín? Reserve your spot for Unsettled: Medellín now! Newer PostTuscany is a Travel Cliché. But We’re Still Going.